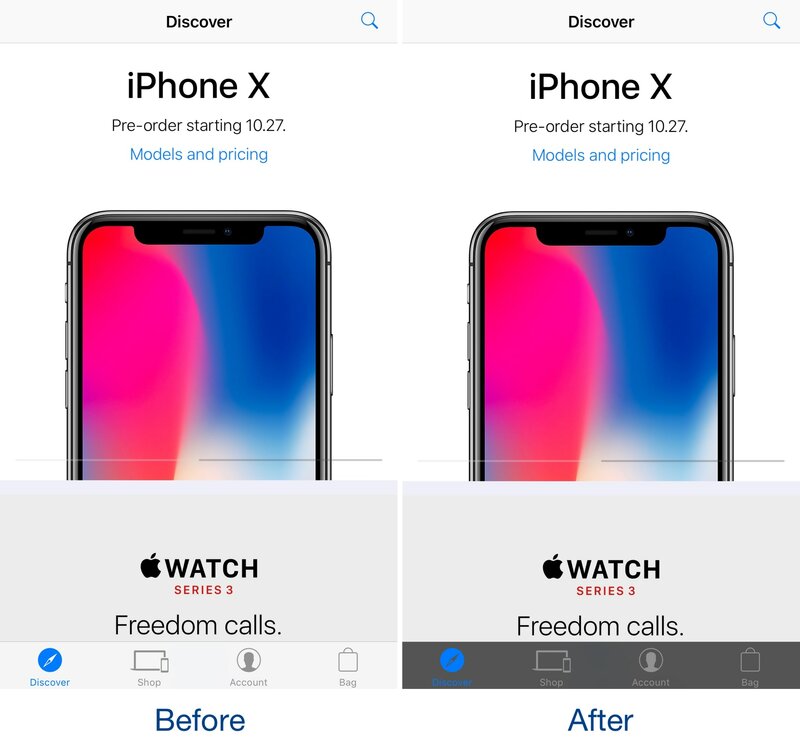 Jailbreakers that use the Apple Store app to browse Apple’s product offerings can take advantage of a new free jailbreak tweak called DarkAppleStore by iOS developer CydiaGeek to spice up its user interface. 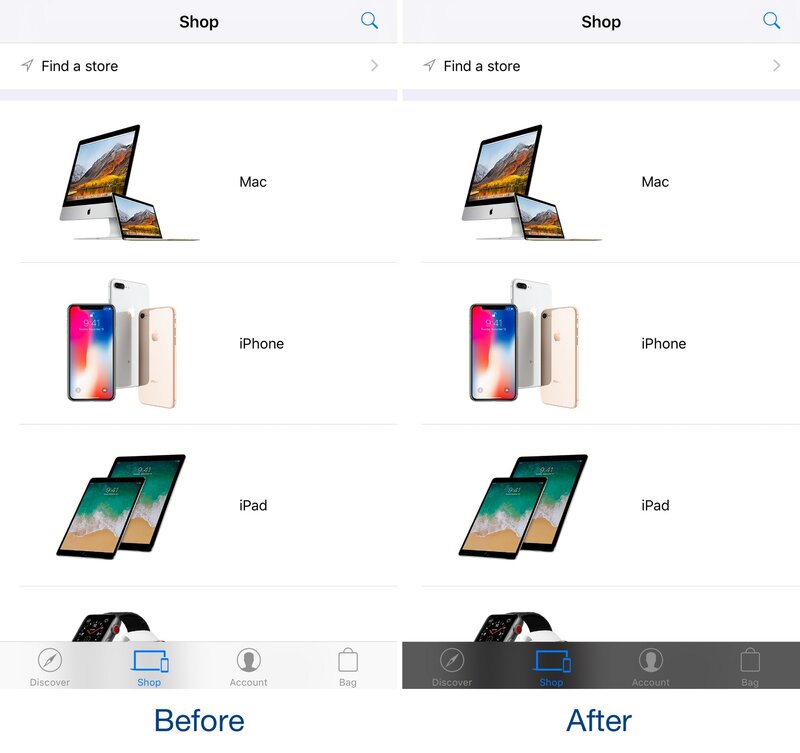 Post-installation, DarkAppleStore applies a darkened blur to the translucent tab bar at the bottom of the app, causing it to resemble the before and after images you see above and below. It’s a polarizing shift from the norm, but considering I’m already partial to the Dark Mode feature available in macOS, I happen to admire these kinds of darkened interfaces. Right off the bat, I like how the tweak doesn’t merely make the tab bar dark in color; it maintains the stock translucency effect so you can discern vague features from the app’s interface behind the tab bar when scrolling up or down. That said, you get a distinct experience with DarkAppleStore that you wouldn’t get from tweaks like Eclipse. When it comes to cosmetic tweaks like DarkAppleStore, everything comes down to opinion. Some people like their interfaces lighter, while others like them darker; personally, I don’t mind when things look more dismal, but your mileage may vary. DarkAppleStore is compatible with all jailbroken iOS 10 devices and works only with the Apple Store app, which is a free download from the App Store if you’re not already using it. Do you like the way DarkAppleStore makes the Apple Store app look? Share why or why not in the comments below! what new Apple devices are you planning on buying?